Irritable bowel syndrome (IBS) is a common condition characterized by symptoms of constipation and/or diarrhea (often alternating), abdominal pain (predominantly low down on the left side), bloating and flatulence. It is a diagnosis made when investigations and tests such as X-rays, colonoscopy and microscopic examinations of the bowel motions are normal, which means that no serious disease such as bowel cancer or colitis is present. It is said to be a functional disorder, meaning that the bowel appears normal in all aspects but just doesn't work normally. This common problem has been known in the past by several names including “spastic colon” or “nervous bowel”. Women are affected twice as often as men and it tends to be a chronic disorder that comes and goes over many years. 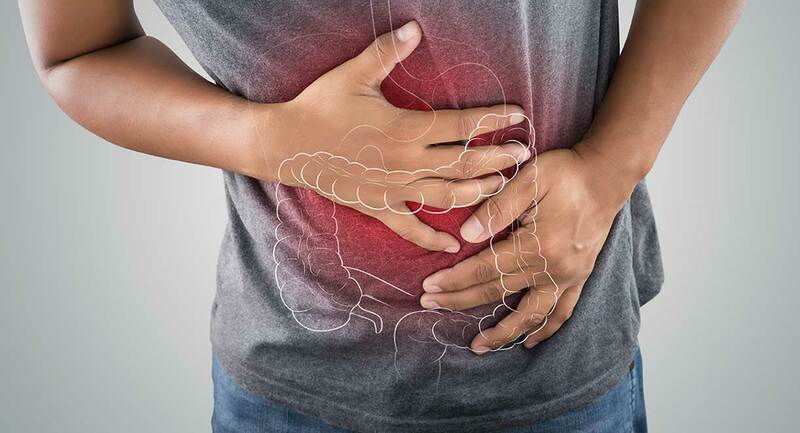 Irritable Bowel Syndrome affects tens of millions of people worldwide; it is estimated that at least 20 percent of all gastro-related doctor visits may be due to IBS symptoms. In America, IBS affects up to 1 in 5. The exact cause of IBS is unknown and is likely to be due to several factors operating together. In all sufferers the end result is a disordered rhythm in the muscles of the gastrointestinal tract. Stress and anxiety - Stress and psychological factors usually play an important role in the development of Irritable Bowel Syndrome. Excessive use of drugs, such as antibiotics, analgesics and alcohol. A diet high in refined sugars. Overgrowth of harmful gut microbes and deficiency of beneficial bacteria in the intestines. A diet high in processed foods. A diet low in fiber or too high in fiber. Lack of water and natural fluids. Food allergies or intolerances may be triggering the symptoms. In Western society the most common culprits are wheat, gluten and dairy products. Western diets also contribute to IBS through lack of fiber, lack of raw foods and lack of water. FODMAP intolerance is also common. FODMAPS stands for Fermentable Oligosaccharides, Disaccharides, Monosacchides and Polyols. They are types of fiber that the human body cannot digest well, therefore they are prone to fermentation in the small intestine. This can foster the growth of harmful gut microbes and produce uncomfortable symptoms such as bloating and gas. Overeating or eating too frequently. Lack of digestive enzymes, hydrochloric acid or bile, which may occur in older persons, or be due to stress. An overgrowth of the yeast, candida albicans, can also give rise to irritable bowel-type symptoms. If you suffer any of these complaints, it is important to be assessed by your doctor. A young girl who has bloating and cramping pains clearly brought on by stress is not likely to require any investigation. However, an older person who develops symptoms of pain and diarrhea for the first time will need a thorough examination of the bowel. Abdominal pains may vary from aching, dull, pressure, cramping, burning or sharp. The pains are usually intermittent and may disappear for long periods of time. Irregular bowel actions; constipation, diarrhea, or constipation alternating with diarrhea. The pain can be felt in any part of the abdomen, though most commonly around the lower left-hand side. The bowel actions may vary from constipation to diarrhea and there may be excessive mucus in the bowel motion. An explanation of the symptoms and an understanding of the benign nature of the condition is often all some people require. Particularly if they have been fearful of an underlying cancer, this type of reassurance may actually improve many of their symptoms. It is important to try to resolve any ongoing stressful situations, or else to improve your stress management. Stress management techniques are very helpful if you feel that psychological problems are prevalent. These include things such as meditation, yoga, tai chi, hypnotherapy and a regular physical exercise program. To rid your body of dangerous toxins, repair your bowel, fight micro-organisms with natural antibiotics found in foods and strengthen your immune system, follow the two week deep cleansing diet found in "The Ultimate Detox" book. Maintain with the vital healthy eating principles in "The Liver Cleansing Diet" book and make these principles a way of life. Note the section on Irritable Bowel Syndrome in this book. Correct diet is a vital part of management of Irritable Bowel Syndrome. Try to eat 3 meals a day and avoid snacking or grazing. Chew your food slowly and thoroughly and don't rush meals. Increasing the amount of fiber in the diet is highly recommended. Include plenty of fresh fruits and vegetables. Your diet should be providing 30 to 40 grams of fiber every day. If your diet is currently low in fiber you should increase your daily fiber intake gradually to allow your intestines to adjust. A gluten free and dairy free diet is best. Raw vegetable juices diluted with water are helpful. It is vital to drink 8 glasses of water daily. Avoid - fried foods, alcohol, processed foods, white flour products, and refined sugars including cakes, chocolates and biscuits. Those with IBS, should never eat foods that are not fresh, and should avoid foods with a high load of unfriendly bacteria, as found in preserved meats (eg. ham, fritz, pizza meat, sausages, bacon, delicatessen meats). If you suspect that you suffer from food allergies, discuss this with your doctor and consider an elimination diet. Typical food allergies which may provoke IBS symptoms include wheat, gluten, corn, dairy products, citrus fruits, FODMAPS, and tea and coffee. Grind flaxseed (linseed) in a coffee grinder and eat 2 to 3 tablespoons daily---place it on your cereal, fruits, vegetables, or mix it in a "smoothie" or in fruit juice. This is a fantastic bowel cleanser and laxative. "Magnesium - The Miracle Mineral". This book discusses Magnesium as being essential for hundreds of chemical reactions that take place in the body every second, with recent findings also indicating that it offers a wide range of important health-promoting benefits. See page 9 for these benefits. "Raw Juices Can Save Your Life". Try the IBS juicing recipe below taken from the book. Wash, trim, chop and process through juicer. Currently, doctors recommend a high fiber diet and stress management as first line treatment. If constipation is a problem, we recommend fiber supplements instead of irritating laxatives. Drugs such as mebeverine, dicyclomine and propantheline which reduce the activity of the bowel may also be helpful. Take 2 teaspoons and gradually increased to 2 tablespoons over 2 weeks - this may be sprinkled onto cereal or stirred into soy, almond or rice milk smoothies - dairy foods should be avoided. Take 2 tablets twice daily or 1 teaspoon daily to help promote relaxation of the bowel wall muscle. Magnesium is known as 'the great relaxer' - it is a very calming mineral so is good for people with a nervous stomach or constipation. Take 1 capsule three times daily with meals. Berberine has antimicrobial properties and is helpful where IBS is caused by dysbiosis or small intestinal bacterial overgrowth. Take 1 capsule three times daily with meals - This will help to top up levels of enzymes in the digestive tract. Apple cider vinegar is also excellent for improving digestion. Take one teaspoon of a high quality organically grown apple cider vinegar mixed in a small glass of warm water and sip slowly during every meal. Take 1 capsule with lunch and 1 capsule with dinner. This will help people with poor fat digestion and can reduce bloating and nausea after meals.